If you are an American Express Cardmember enrolled in the American Express Membership Rewards® Pay with Points program, you are now invited to use your points to pay for your next cruise or vacation! 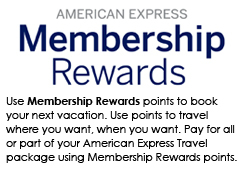 American Express Membership Rewards® Points are part of American Express' loyalty program, which enables you to earn points when you use your American Express Card. Now, those points can add up to big savings on your next cruise - and can even pay for the entire vacation! TZOO Promo: Best Alaska Cruise Deal Ever from $399! 7 Night Alaska Cruise Roundtrip Seattle! Book a Suite and receive $250 Onboard Credit! Sailings within 90 days require full payment on date of purchase. Book Online or Call 1-800-758-5693 to reserve your cabin! Hurry space is limited and sells out quickly! TZOO: Northern Europe Summer Cruise Includes Airfare & Taxes from $1849! Other airfare cities are available at DEEPLY Discounted Rates! Certain flights or carriers may have an add collect for more desirable flights. Call 1-800-758-5693 to book your cabin! TZOO: Yukon Cruisetour with Denali & Dawson Dollars, Free Grats and more! $100 Denali Dollars per cabin! $50 Dawson Dollars per cabin! PLUS Free Gratuities on your Cruise for Guests 1 &2! PLUS Taxes and Fees are included in advertised price! TZOO: Canada & New England Cruise w/ 3rd & 4th guest FREE or Reduced! If booking is within 90 days payment is due in full. All prices listed are per person based on double occupancy, government taxes are additional. All prices are subject to change at any time, call for the best available pricing: 1-800-758-5693.